“But is it 10 times better than a CX-3?” asked my wife, making a sarcastic jab at the CX-30’s name. The answer to that question remains to be seen. For now, though, it is almost a certainty that it is better than a CX-3. Sized for urban maneuverability, and shaped for maximum owner satisfaction, the new CX-30 was “developed in pursuit of automotive styling as a work of art,” according to Mazda. 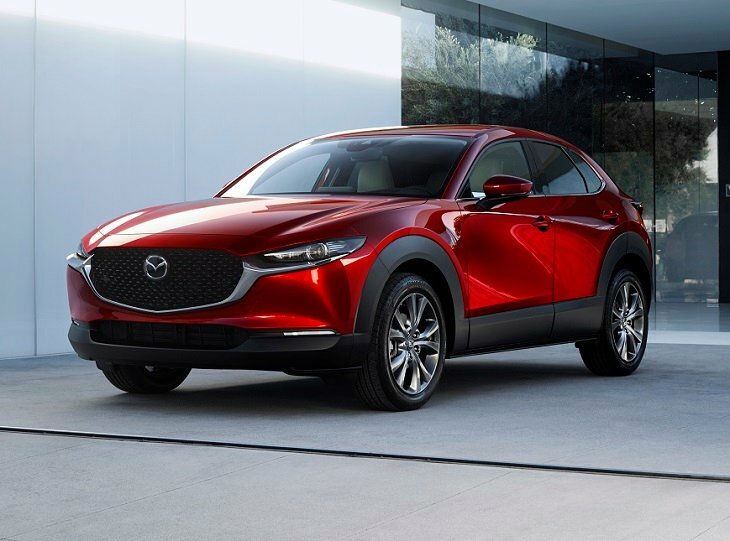 An evolution of the company’s Kodo design theme, the CX-30 demonstrates the same minimalism, elegance, and reflective flanks seen on the latest Mazda 3. The company says it has the rugged look of an SUV, the rakish roofline of a coupe, and the wide stance of a sports car. This isn’t a Mazda 3 hatch raised up and equipped with black lower body cladding, though. It gets its own design, including a far slimmer rear roof pillar design complete with quarter glass for improved visibility. New pulsing LED turn signal indicators accompany front and rear LED lighting. Mazda says the CX-30 will be offered in nine colors, including Soul Red Crystal, Machine Gray, and Polymetal Gray. Because the new CX-30 sits higher off the ground, Mazda promises easy entry and exit. This, combined with seats designed for optimum support and roomy rear accommodations, makes the CX-30 comfortable for both “tall” and “heavily built” people. Once you’ve slipped behind the telescopic steering wheel, you’ll face the symmetrical cockpit layout from the Mazda 3 and windshield pillars shaped specifically for maximum outward visibility. Mazda also installs wipers that sweep a greater percentage of the windshield surface area than is typical, and they include integrated washer jets. The driver’s seat cushion adjusts to provide thigh support, and a wide center console with a padded armrest separates the CX-30’s front seats. The infotainment controls reside on the center console, and the CX-30 is equipped with a standard shift lever rather than buttons or switches. Especially in higher trim levels, quality materials and steps taken to quell noise, vibration, and harshness contribute to the CX-30’s upscale interior ambience. Lower trim levels features cloth or leatherette seating in Greige (grayish beige) or Black with Dark Blue contrast elements. Top trim features Black or Pure White leather upholstery with Dark Brown contrast elements. Luggage space behind the available power liftgate measures an estimated 15.2 cu. ft., including the bin underneath the cargo floor. Mazda says this is enough to accommodate a standard stroller and a carry-on piece of luggage. Mazda announced three engine choices for the new CX-30. The most common is likely to be the gasoline-fueled Skyactiv-G 2.0-liter 4-cylinder with cylinder deactivation and M Hybrid (mild hybrid) light electrification technologies. Mazda says M Hybrid enhances acceleration while also improving fuel economy. Buyers can upgrade to the Skyactiv-X 4-cylinder engine with Mazda’s new Spark Controlled Compression Ignition system. This is a gasoline engine with the torque of a diesel and the linear, smooth revving, high-rpm traits of a traditional gas engine. Mazda also says that a diesel-powered Skyactiv-D 1.8-liter 4-cylinder engine will be available, though it might not be offered in the U.S. market. Another potential no-show for Americans would be the CX-30’s 6-speed manual gearbox. Instead, a 6-speed automatic is likely to come standard, powering all four of the SUV’s wheels through an i-Activ all-wheel-drive system with rear-axle disconnect. Approximately 30% of the CX-30’s Skyactiv Vehicle Architecture is comprised of high-strength steel, helping to improve the ride and handling, according to Mazda. The automaker’s G-Vectoring Control Plus technology is also standard, known for supplying smoother and more responsive handling. A set of 16-in. wheels will be standard, with 18-in. rims available as an option. The CX-30 sits on a MacPherson strut front and torsion beam rear suspension, just like the new Mazda 3. In the Mazda 3, the automaker promises that the simpler rear suspension design won’t compromise driving dynamics, so that assertion should extend to the CX-30. Should you elect to go off-road, know that ground clearance measures an estimated 6.9 ins. In addition to adding a standard knee air bag to the CX-30, Mazda has updated its suite of i-ActivSense technologies. Available upgrades include a new driver-monitoring system, front cross-traffic alert system, and an adaptive cruise control system with Cruising & Traffic Support. After the Mazda 3, the CX-30 is the next model in the automaker’s lineup to receive the latest MazdaConnect infotainment system with a larger 8.8-in.-wide display screen and revised menu selection for easier use. Mazda also claims that it conducted a study to determine how audio components should be arranged to maximize clarity of sound, and the CX-30’s standard 8-speaker setup reflects the company’s learning. A 12-speaker Bose premium sound system is available. Mazda will also make its Active Driving Display head-up display technology available to CX-30 buyers.